There is a parade in Shrewsbury this Sunday. It is the first annual Shrewsbury Day Parade. Mike Stewart wanted our Tucker in it but I have it apart for repairs at this time. 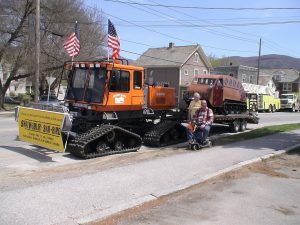 Dave is going to put his snow coach on a trailer and have that in the event. Mike is looking for members to be there. The parade starts at 11:00 AM. Contact Mike at 492-3312 if you have any questions or can help in any way. We hope to see you there! This is what the Tucker looked like a parade in Rutland a few years ago.